With a busy schedule, this client wanted to create a home oasis where she could neatly store her wardrobe, as well as her impressive collections of handbags and shoes. Function was key, as was a custom design that would give her flexibility, peace of mind and timeless style. To achieve this, she turned to California Closets Houston where design consultant Neelam Ali provided ideas for reimagining her closet down to every last detail. 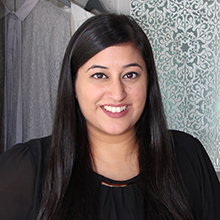 Neelam took all of the client’s needs into account starting with creating designated shoe storage, as well as incorporating plenty of long, hanging area for dresses worn regularly for work. By adding accent lighting, Neelam enhanced the closet’s rich combination of Cashmere and Ivory finishes, while elegantly showcasing the client’s now well-ordered clothing, as well as impressive collections of shoes and accessories. Ample drawers for folded items, clean, open shelving and even hidden hampers all helped to deliver the everyday functionality Neelam’s client wanted without sacrificing the aesthetic quality of the space. It was a pleasure working with this client. We kept an open dialogue throughout the process to ensure the result reflected the design she envisioned. Neelam helped her client discover that the California Closets experience doesn’t mean you have to choose between style and utility. With everything in its place, this stunning closet creates calm and lasting value.